Howdy, y’all. I’m 46 now. I’m now six years older than my father was when he died. In some ways, I’m healthier. In others, well, you know the deal. At my last appointment, my rheumatologist said she didn’t know what else to try because various meds did not have much of an effect. She also joked that I’m one of the rare types who lose weight on Cymbalta rather than gain. Ha, ha. (Note: I went off Cymbalta and gained everything I’d lost. I’ve since tweaked my menu and am back on the losing track.) she also had no answers for me about my swelling hands or glands on my neck. I am not amused. I have an appointment with my primary later this month. Maybe she’ll have answers for me since I had blood tests a few weeks back. I’m tired, frustrated, and still fighting. Going more natural in conjunction with some meds to find the optimal balance and solutions. I’ll always have arthritis and Fibromyalgia. How my body handles them is what will change. I’m listening to my body more and found the ideal training schedule. I wear my pedometer every day and strive to get in more steps each week. I eat more leafy and non-starchy plants than bread and other starchy goodness. I eat less sugar. 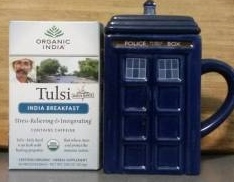 I drink lots of water and herbal teas, especially those containing adoptogenic herbs (Organic India’s Tulsi Teas are my favorite). I’m getting more sleep and taking Melatonin for help on bad days. I nap when necessary. I will get better. I will improve my quality of life. It’s getting better every day. Cheers! How are you celebrating the newest year of your life?